At first glance, Gilead Sciences, the maker of blockbuster Hepatitis C drugs Sovaldi and Harvoni, looks very, very cheap. At a stock price of just under $85 a share, you would only need to pay around 7 times current trailing twelve months earnings for a share of the enterprise. For a company that brought in almost $12 in earnings per share, net profit of $18.1 billion, and free cash flow of $19.6 billion – yes you read that correctly – it seems awfully tempting to jump into the stock without thinking. The first question an investor needs to ask is why? A free lunch rarely exists in the markets. In order to find out if this is one of those rare free lunches, you need to invert your thinking process and work backwards. Rather than asking whether Gilead Sciences stock is cheap, we need to ponder if it is expensive. We would start the premise on the grounds that the stock is expensive and then gather the data to attempt to prove this premise. We can judge at the conclusion whether our analysis provides credence to the question of whether Gilead stock is expensive. Think of Gilead as Apple and think of Sovaldi and Harvoni as the iPhone. Back in 2011, Gilead paid $11 billion to acquire Pharmasset. The acquisition of Pharmasset would prove to be the catalyst to developing Sovaldi. And the rest, like they say, is history. Sovaldi and Harvoni quickly became the top selling new drugs in the history of the industry. These two drugs bring in a large majority of revenue and profits for Gilead, just like the iPhone does for Apple. Like Apple and its iPhone, the success of Gilead’s blockbuster products are also the source of the market’s concerns. What happens if Sovaldi and Harvoni are the best selling products Gilead will ever create? It could turn out to be a case of a peak earnings trap, where Sovaldi and Harvoni represent the peak of Gilead’s earnings and profits, which if it turns out to be true, would be causing the shares to look “cheap” when it is actually the opposite. Additionally, Gilead operates in a fiercely competitive industry where other major biotech companies such as Abbie Vie, Merck, Bristol-Meyers-Squibb, and Johnson & Johnson are consistently scale the fortifications and bring down the moat of Gilead’s most lucrative franchises. All of the companies mentioned compete in the treatment for Hepatitis C.
To make sense of why Gilead seemingly trades at such a cheap valuation, the broad consensus appears to be questions surrounding Gilead’s ability to replicate the success of its past, namely making a smart acquisition (ex. Pharmasset) that will act as a catalyst to growth. While this article will not go into the depths of analysis on Gilead’s drug franchises and projected growth and potential acquisitions, this humble author can synthesize for you that the general fear placing such a low valuation on Gilead’s stock surround the question: what’s next? When you go out to gather data on Gilead, try to prove the thesis that Gilead is an expensive stock. 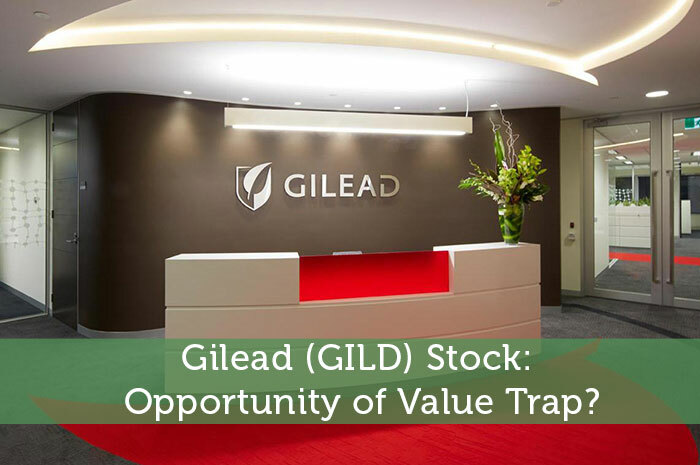 If the data is solid, and the analysis compelling, then it should make you stop and consider whether Gilead stock is a value trap. If Gilead can withstand your intense scrutiny, it may just be a shimmering opportunity. Disclosure: This author is long AAPL. Gilead (GILD) Stock: Opportunity or Value Trap?